Mazie Hirono, Hawaii's newest member of Congress, called her first day in office a "combination of work and celebration." Her first workday in Washington, D.C., yesterday was also fairly pleasurable. She was sworn into office twice and received her member-of-Congress pin, which lets her speed through Capitol security checks. 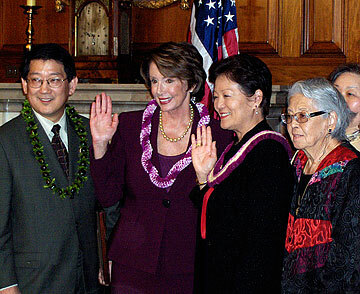 Hirono was sworn in officially on the floor of the U.S. House and then later in a photo op with House Speaker Nancy Pelosi. Democrat Hirono, 59, said in a phone interview that her first vote was for Pelosi as the first female speaker in U.S. history. "I cast my first vote for Nancy, in memory of Patsy Mink, and I know how proud Patsy would have been to see Nancy become speaker," Hirono said. The selection, Hirono said, was a "breaking of the marble ceiling in Washington" and sends a message to women. "It is a terrific message to women and young girls that women can lead," Hirono, a former attorney, state legislator and lieutenant governor, said. Watching Hirono was her husband, Leighton Oshima, her mother, Laura Hirono, and her mother-in-law. "My mother has been my inspiration my entire life, teaching me by example about tenacity and the value of hard work and family," Hirono said. "And Leighton ... has been there right with me through all those long days and nights of campaigning. Even though he knows that my serving in Congress will mean that we are apart a lot of the time, he has supported me every step of the way," she said in a news release. After the first votes, Hirono said she expected to attend one of the many receptions to honor Pelosi. "There will be various receptions. Tony Bennett, one of my favorite singers, and Carole King, another of my favorites, will be performing," Hirono said. Also taking the oath of office yesterday was Rep. Neil Abercrombie, who has represented urban Honolulu's 1st Congressional District since 1991. 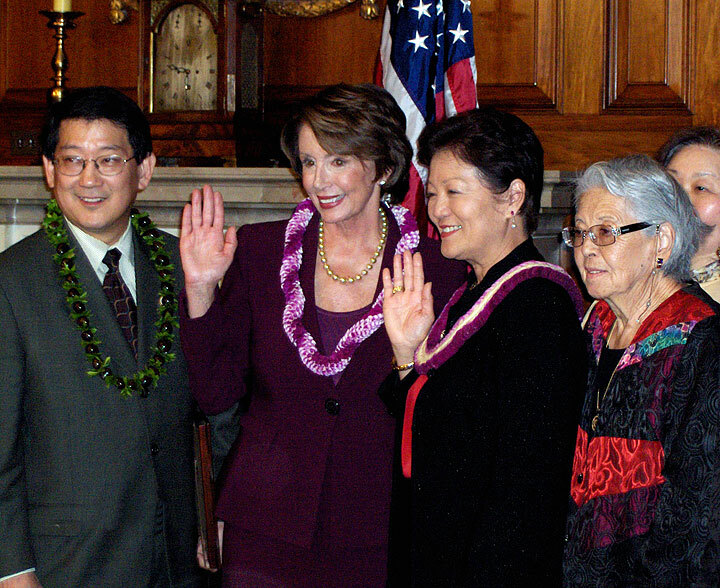 In the Senate, Hawaii's Daniel Akaka was sworn in. He was first appointed to the senate when Sen. Spark Matsunaga died in 1990, then won the election in 1994 and was re-elected in 2000 and 2006.